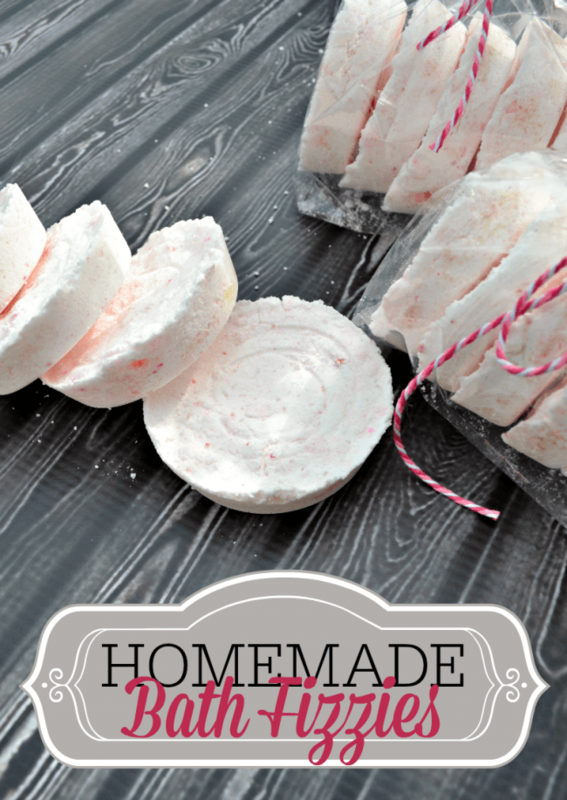 Learn how to make homemade bath fizzies, also called homemade bath bombs. Packaged up with a bag and ribbon or in a jar make a cute handmade gift. I love bath bombs but when you buy them from the store they can get a little expensive, averaging around $4 to $6 a piece. Yikes! Why buy them though when you can make a whole batch of homemade bath fizzies for the cost of just a few supplies? The first step you will want to do is mix your dry ingredients (baking soda, cornstarch, Epsom salt, and citric acid) together. You can find citric acid most likely around the kitchen aisle with the mason jars and canning supplies. Mix 5-10 drops of your desired color of food coloring in a spray bottle with water. Make sure your spray bottle has a misting feature because you will need it. Now you want to lightly mist your dry ingredients. I bolded lightly because it is important that you don’t over mist. If you do over mist your mixture will bubble itself up before you even get to use it in the bath. No Bueno!! Mist lightly and then mix around, rinse and repeat until you get the desired color. I mixed my ingredients in a 9×13 pan and misted lightly and kind of folded it in like a cake, highly technique. haha! Drop in a few drops at a time of your favorite essential oil and mix around. If you want it to be stronger drop in a few more drops. Now that your mixture has its color and scent you are ready to mold your bath fizzies. I used a muffin tin but you can use any type of mold you have available. Fill your molds and allow to dry for 24 hours. Once your molds are dry you can pop them out and they are ready to give as gifts or use for your own relaxing bath. Makes approximately 18 bath fizzies. These are a lot cheaper than buying them from the store so they would make great wedding favors for your bridal party or bridal shower. They would also make great gifts for Mother’s Day, Christmas, a special birthday, etc. 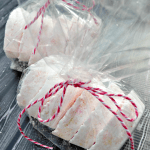 Want to print this Homemade Bath Fizzies recipe? Mix your dry ingredients (baking soda, cornstarch, Epsom salt and citric acid) together. You can find citric acid most likely around the kitchen aisle with the mason jars and canning supplies. Mix 5-10 drops of your desired color of food coloring in a spray bottle with water. Make sure your spray bottle has a misting feature because you will need it. Now you want to lightly mist your dry ingredients. I bolded lightly because it is important that you don't over mist. Your mixture will bubble itself up before you even get to use it in the bath. Mist lightly and then mix around, rinse and repeat until you get the desired color. I mixed my ingredients in a 9x13 pan and misted lightly and kind of folded it in like a cake, highly technique. haha! 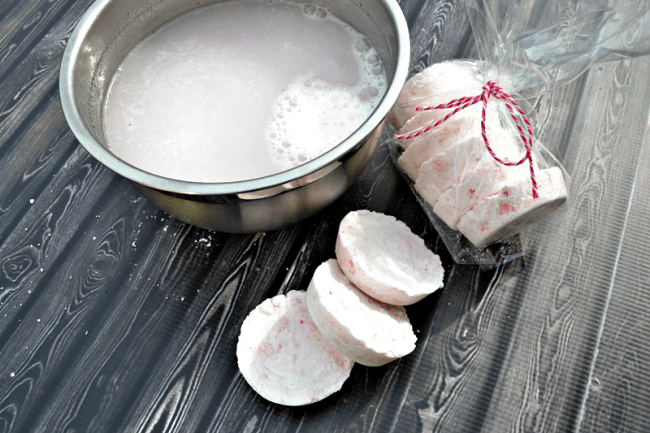 Now that your mixture has its color and scent you are ready to mold your bath fizzies. I used a muffin tin but you can use any type of mold you have available. Fill your molds and allow to dry for 24 hours. Once your molds are dry you can pop them out and they are ready to give as gifts or use for your own relaxing bath. Ohh these look fun and pretty do-able! Thanks for posting! A batch made approximately 18. These are so cute! I made my first batch ever last night following this recipe. They turned out perfect. The mixing part took a little longer than I expected but you definitely need to take your time and mist it lightly like the directions say to do. My daughter can’t wait to try them. They are going to make great little gifts. Thanks for the recipe. Glad you like them, they definitely are great ideas for gifts. Make great stocking stuffers! I would love to know where/how you source your citric acid. It has not been an easy thing for me to find in any great quantity, and I really would love to be able to make these. Kate, I just pick it up in the canning section (with the Mason jars) of my local Walmart/Target. I’m new to DIY crafting and keep seeing “essential oils” pop up. I’m just curious if they are strictly to enhance the scent or do they serve other purposes? Like could I use vanilla/almond extract instead? Essential oils do serve other purposes although for this bath fizzies the jasmine was mainly for just scenting and you could definitely just use a vanilla extract for that. Although it may change the coloring slightly. Do you have any favorite oils that you like to use in this recipe? 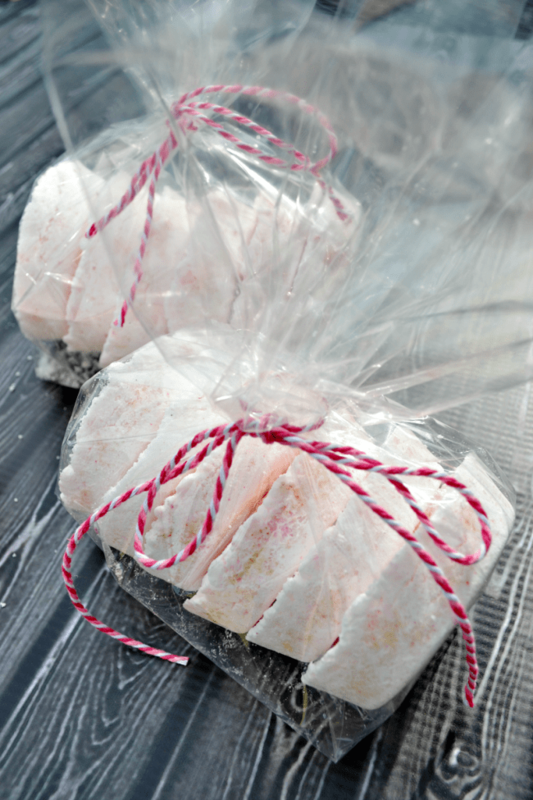 I’ve never made bath fizzies and would like to make some as Christmas presents. Also, how long do they last? I really like Jasmine because I love the smell but some others that would be great would be lavender, orange, peppermint. It really is dependent on what scents you like because there are so many out there. They can last for a really long time assuming you keep them away from moisture.